It sounds a bit stupid to record silence. But if the equipment can capture something in the silence you can not hear with your bare ears, then it can be very interesting. For instance, you never know what you will see when you look into the deep space with telescope. You never know what you will hear in the silence with a low noise microphone. I will not define all my views of different silence, but for sure, silence is never completely quiet and it is my favourite recording material. Best time to get „silence“ is normally during the night in calm weather after sunny day (like this one). In such moments temperature waves are also calm or in layers, so sound can travel long distances without being disturbed. Noise from one car can travel up to 30 km in open field and if you hear it with your bare ears it will be clearly audible through most quality recording gear today. Amplifying sound with low noise microphone, works like a telescope. It drags weak sound far away closer to your ears. In places where you need to hold your breath to hear probably only your heart beat, it can be a very busy place in your headphones. But there is also other kind of silence. It is on hot sunny days when wind blows and the air is very unstable. Sound normally does not travel long distances in such circumstances. One of these days was 18th of July 2016 on the World Listening Day. I was traveling on Kjölur, west highland route in Iceland. The sun was shining all day and the wind was blowing from the south. 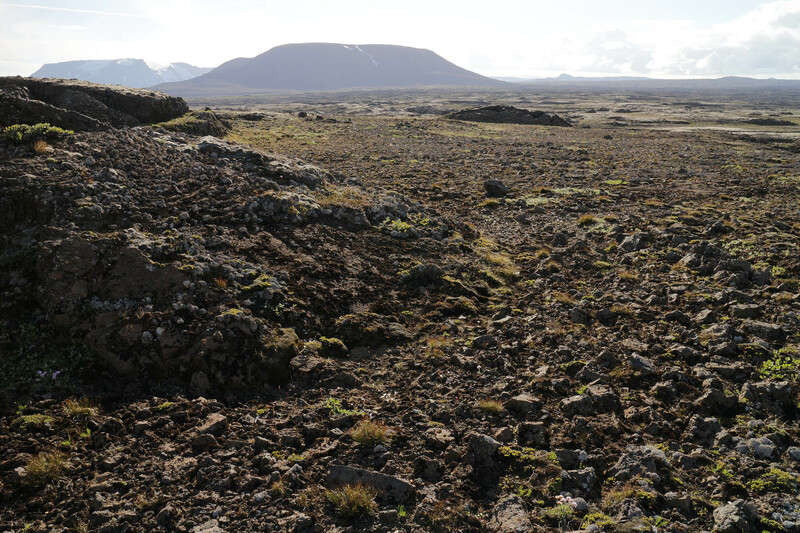 I took of the main rode and followed a track into Kjalhraun lava field. My plan was to find the mysterious Beinahóll (Bone hill) and the field where Reynistaðabræður (Reynisstada brothers) and almost 200 sheeps lost their lives in a insane weather in September 1780. It is still possible to find bones on this field so for a long time I have bin interested in this tragic story. But the track through the lava was too ruff for my car so I kept on by food. Many times for almost three decades it has been my plan to find this place while travelling by bike over Kjölur. I never did it because I was always wearing a green jacket and for superstitions reasons it has been told dangerous. This time I did not find Beinahól. Instead I started recording the silence in the lava. The weather was a typical sunny „midday silence“, where the thermal heat from the sun makes the air unstable so sound waves did not travel long distances. This was one of these days I did not hear any plains or car traffic, even though Kjölur main route was not far away. When I held my breath, I only did hear weak bird song in the distance and some flies around. Because the mics are located close to the ground, you will also hear the wind wipe the ruff lava surface. This recording is captured with MKH20 microphones and SD744 recorder. Gain was set at 56dB and HPF 80Hz. In post the gain was again raised about 25dB. Below 20Hz and above 10Khz the freq. was pulled down by 25dB.